Asia is a heaven for architecture and photography lovers, and the city of Shanghai is no exception. The Chinese metropolis has undergone dramatic changes over the last few decades, resulting in a fascinating and eclectic mix of old and new buildings. 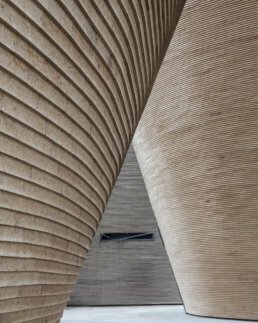 If you’re planning a visit, make sure not to miss the following highlights of Shanghai architecture – some of which may not be in your travel guide. 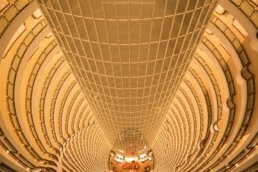 Our photographic journey kicks off at the Grand Hyatt Hotel, which is located in the iconic Jin Mao Tower, and used to be the highest hotel in the world. I did not stay at the hotel, so I cannot comment on the quality of the rooms, but in terms of architecture, its interior is something special to behold. The Grand Hyatt Hotel begins on the 53th floor of the Jin Mao Tower and rises to the 87th floor. Upon entering the reception area at ground level, take the elevator to the main lobby on the 54th floor, and then go two stories up, to the 56th floor. This is where you’ll find the hotel’s impressive atrium. Provided you don’t have a fear of heights, you’ll want to go up even further. Looking down from the 87th floor offers the most spectacular views – but make sure to keep a firm grip on your camera. 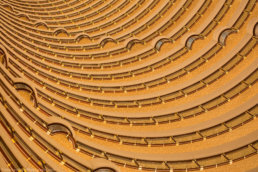 The Grand Hyatt Hotel begins on the 53th floor of the Jin Mao Tower and rises to the 87th floor. Take subway line 2 and get off at Lujiazui. It’s a 5-10 minute walk to the Jin Mao Tower, which houses the Grand Hyatt Hotel. At 421 meters, the Jin Mao Tower is one of the tallest buildings in the world, so you’ll have a hard time missing it. 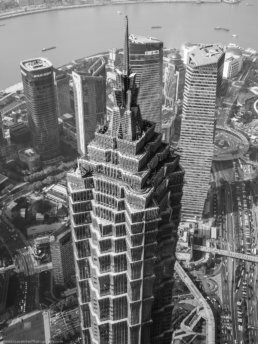 But to give you a visual point of reference: this is what Jin Mao Tower looks like (I took this picture from the observation deck of the Shanghai World Financial Center). 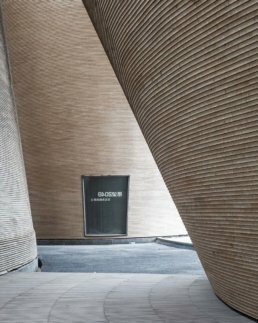 After visiting the Grand Hyatt Hotel in the bustling business district, let’s head southwards, to a less well-known piece of Shanghai architecture (although it has become a local favourite among Instagrammers). Located on a parking lot next to the Power Station of Art is a former site of the Shanghai World Expo. 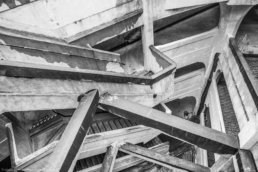 The site looks deserted and run-down these days, but its one-of-a-kind architectural structures provide splendid photo opportunities for anyone who loves to play with depth and lines. I even went so far as to take a selfie, which I normally never do. This place just begs for a human element to convey a sense of its scale. Take subway line 4 to Nanpu Bridge. Walk to the Power Station of Art, at Huayuangang Road. Next to the Power Station, you will see a large parking lot. You should easily recognize the site you’re looking for from the photos above. 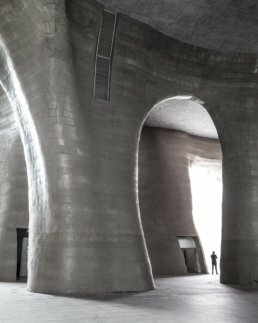 Ready for more Shanghai architecture? 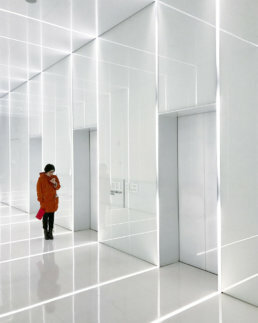 Right in the center of the city is a relatively new office building with a glassed and mirrored interior that makes for interesting reflection photography. Walking through the main lobby at ground level, you’ll get the feeling that you’re entering a world of multiple realities. 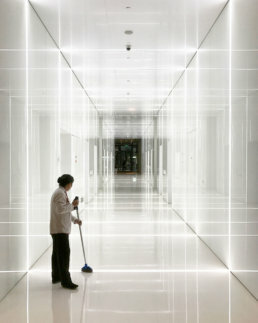 The office is located at Soho Fuxing Plaza, right next to the Xintiandi subway station (take line 10). Just as futuristic-looking is Himalayas Center Shanghai, in the eastern part of the city. 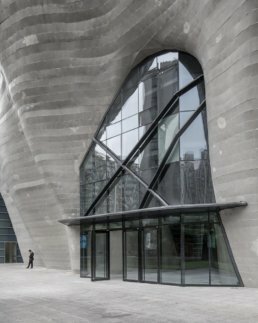 Part shopping mall, part art museum and theatre, Himalayas Center fuses modern design with Chinese ideas of nature and humanism. It provides the perfect backdrop for wide-angle compositions that combine human and architectural elements. Take subway line 7 and get off at Huamu Road. It’s a 5-minute walk to Himalayas Center. Our photo tour ends in the Hongkou district, at another striking piece of Shanghai architecture called 1933 Shanghai. 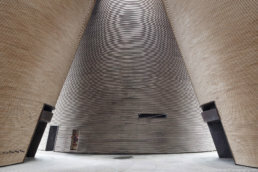 Originally designed and intended as a slaughterhouse, 1933 Shanghai now hosts galleries, exhibition spaces, and restaurants. 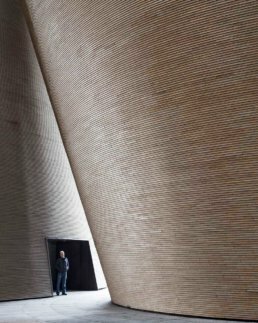 Its maze-like structure echoes the work of M.C. Escher, which makes this massive concrete building a bit disorienting at first. But don’t worry, you’ll easily find your way out before dark. Take subway line 4 or 10 and get off at Hailun Road. It’s a 10-minute walk to 1933 Shanghai, which is located at 10 Shajing Road. While you’re in the Hongkou district, don’t forget to visit the former Shanghai Jewish Ghetto to explore an oft-forgotten piece of history.